I thought it would have been better to buy earlier. very good. This review is about item#9892757. This review is about item#9892775. I use it for welding work. Although it is use of a hobby grade on a holiday, it is enough enough. I regret that I would have bought it early. I stock some stocks, but I can use it without any problem. This review is about item#9892766. It was used when welding to the loading platform on the fuel tank of the dump, because sputtering directly falling into the tank would cause fire, so we could weld it safely by welding and welding. I think that it is light weight and workability is good. I will try to use it for future on durability. When using the wood stove in the tent. It can be used to protect floor mats from heat when using wood stove in tent with winter camp. I am saved because sparks are less likely to scatter. Improvement point, it is hard to convey heat to the reverse side, if you can devise your ingenuity, it is the best. We are using it as a curing tool for Thunder and electric tools and processing work. As a product, I am very satisfied. Early delivery was also really helpful. There is no burning of the floor, so you can work with peace of mind. However, it is cold in the winter! ! It is light and cheap, and we use it without any problem. I would like to purchase it next time. This review is about item#09892766. It is thin and light and easy to handle, but short-time use is OK, A thick sheet is good for long use. It is used in conjunction with the spark elimination sheet. Because it is a monotaro brand, we are looking for a cheaper price a little more. It is used in conjunction with the spark removal seat at the time of welding, It is good to shut off against sparks and work, I am using large and small, but it is good if there are a little more eyelet holes. 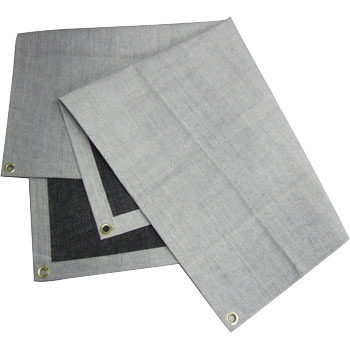 It is thin and light, so it is very easy to handle and the quality is also very good. Quality is also good and easy to use. I think I want to do more. Used in vertical hanging. Since it is light, there is no need for strength to fix, and gas cut can be used for vertical hanging. If it is horizontal use it is recommended not to be light. The price is cheap but I want you to make it cheaper ★ 4 ★.